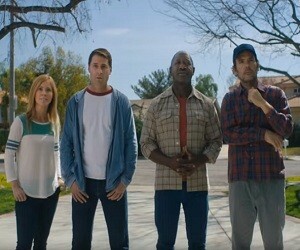 The Husqvarna Days Dealer commercial shows a man talking to four of his friends, three men and a woman, in his yard. “Guys, do you like my lawn? Trimmed and edged to perfection. Johnson, do you remember what your lawn looked like last year? Cause I sure do. And Ron, it might be time to get a new trimmer. But don’t worry, guys. I know what you need. Check this out! A boost. At this point, he lifts his garage door so that his friends can see the Husqvarna products stored inside. The narrator says: “Put your hands on professional equipment. Get ready for Husqvarna Days at your local dealer”. The offer is valid from March 15 to June 15 this year.